The ultimate goal in trauma resuscitation is to promptly identify and treat all injuries. Despite clinical and technological advances in the diagnosis and treatment of trauma patients, missed injuries continue to significantly affect modern trauma services. Delayed diagnosis and missed injuries have the potential to exacerbate the severity of the initial insult, and may result in permanent disability or even mortality. Moreover, missed injuries add significantly to the length of hospitalization and overall costs of trauma patient care. 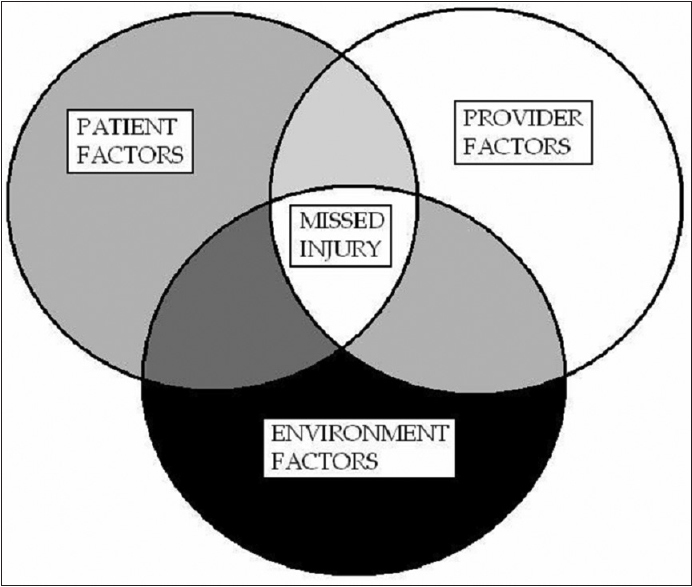 This article will discuss the common themes associated with missed injuries, and will highlight steps that practitioners can take to minimize delays in diagnosis and to reduce the number of missed injuries. This article begins with basic definitions, followed by a discussion of literature pertaining to, and factors associated with, missed injuries. We will then focus on specific mechanisms and injury patterns, as well as the corresponding injury-specific diagnostic and treatment pitfalls that have to be considered in order to avoid missed injuries. The following core competencies are addressed in this article: Interpersonal and communication skills, Medical knowledge, Patient care, Practice-based learning and improvement, Systems-based practice. Republished with permission from: Stawicki SP, Lindsey DE. Trauma Corner – Missed traumatic injuries: A synopsis. OPUS 12 Scientist 2009;3(2):35-43. The nuclear pore complex (NPC) is an important functional entity of every eukaryotic cell's nuclear membrane. It enables selective transport of materials across the nuclear membrane in an organized and orderly fashion. Substances carried in and out of the nucleus by the NPC include three major groups of molecules: (a) Messenger ribonucleic acid molecules, (b) proteins, and (c) ribonucleoproteins (RNPs). The transport across the nuclear membrane involves adenosine triphosphate hydrolysis in the great majority of cases even though certain guanosine triphosphate-hydrolyzing mechanisms have also been identified. The understanding of the NPC appears crucial to our understanding of certain pathological processes. For example, it has been found that certain human viruses can “trick” our cells into transporting their RNPs into the nucleus using signal peptides similar to the human nuclear-localizing signals. The major challenge of today's research on the NPC resides in identification of over one hundred of its distinct polypeptide units and in determining their functions and interactions. To date, many of the structural proteins involved in the NPC have been identified, but the mechanism of their interactions still remains largely hypothetical. This project discusses the structure and function of the NPC. The following core competencies are addressed in this article: Medical knowledge. Republished with permission from: Stawicki SP, Steffen JM. The nuclear pore complex: A comprehensive review of structure and function. OPUS 12 Scientist 2007;1(2):39-87. Key points: (a) Iatrogenic vascular injury is a rare but well recognized complication of spinal surgery; (b) The most serious injuries involve the aorta and its major branches; (c) Vascular injuries following spinal surgery can present early or late; (d) Early presentation usually involves intraoperative hemorrhage and may be associated with hemodynamic instability; (e) Injuries that present late include pseudoaneurysms and arteriovenous fistulae; (f) Arteriography– traditional, CT or MRI angiography– should be used to diagnose the injury and define relevant vascular anatomy; (g) Therapy may require surgery or interventional techniques. The following core competencies are addressed in this article: Medical knowledge, Patient care. Republished with permission from: Reilly EF, Weger NS, Stawicki SP. Vascular injury during spinal surgery. OPUS 12 Scientist 2008;2(2):7-10. Retroperitoneal sarcomas (RS) are malignant tumors arising from mesenchymal cells, which are usually located in adipose, muscle, or connective tissue. RSs represent approximately 15% of all sarcomas and approximately 33–55% of all retroperitoneal tumors. The most common variants of RS include liposarcoma (40%), leiomyosarcoma (30%), and malignant fibrous histiocytoma (<10%). This article reviews the most important clinical characteristics of RSs, focusing on high-yield facts frequently encountered on standardized exams. The following core competencies are addressed in this article: Medical knowledge, Patient care. Republished with permission from: Stawicki SP. Retroperitoneal sarcomas. OPUS 12 Scientist 2007;1(1):17. 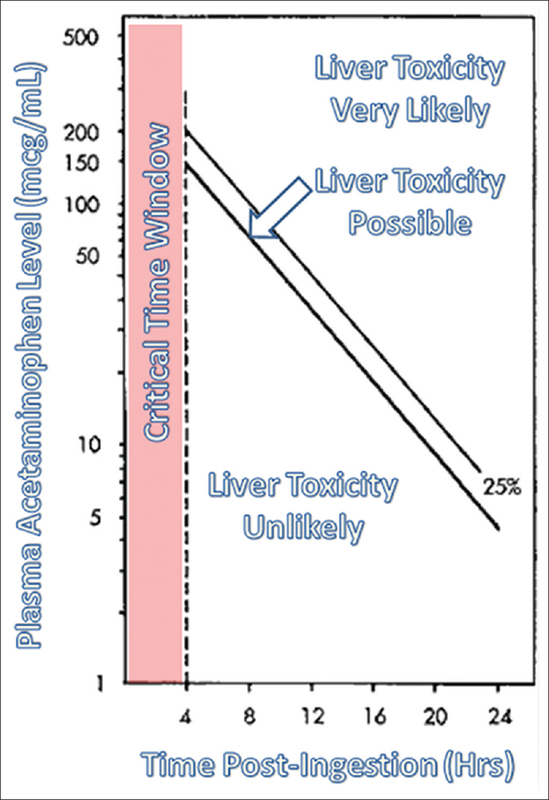 Key points: (a) It is imperative that critical care practitioners are familiar with the most commonly encountered types of poisoning and toxicity– early recognition and appropriate intervention are crucial when approaching patients affected by toxins and poisons; (b) Acetaminophen toxicity has four distinct stages, predictable toxicity within 4-24 h of exposure, and can be treated with N-acetylcysteine administration; (c) Anticholinergic toxicity is associated with characteristic signs and symptoms, including hyperthermia, dry skin, flushing, mydriasis and delirium; (d) Cyanide poisoning can be rapidly fatal– early recognition and treatment with thiosulfate, hydroxycobalamin, or amyl nitrate are essential; (e) Digitalis toxicity is associated with either increased drug level or increased sensitivity to the drug, and can produce a variety of symptoms (mostly non-specific)– cardiac arrhythmias constitute the most common cause of mortality; (f) Lithium toxicity can result in severe neurologic and cardiovascular symptoms– dialysis may be indicated in cases of severe toxicity or concurrent renal failure; (g) Organophosphate poisoning is characterized by muscarinic side effects, nicotinic side effects and central nervous system toxicity– muscarinic symptoms seen in acute organophosphate poisoning can be remembered by the use of the mnemonic DUMBELS (defecation, urination, miosis, bronchorrhea, bronchospasm, bradycardia, emesis, lacrimation, and salivation). The following core competencies are addressed in this article: Medical knowledge, Patient care. Republished with permission from: Reilly EF, Stawicki SP. High-yield toxicology: Essential facts for the critical care boards. OPUS 12 Scientist 2008;2(1):33-38. Refeeding syndrome (RFS) is a clinical entity occurring in severely malnourished individuals, usually after initiation or reinitiation of definitive nutritional support. The clinical presentation is varied, and a high index of suspicion is required for diagnosis. 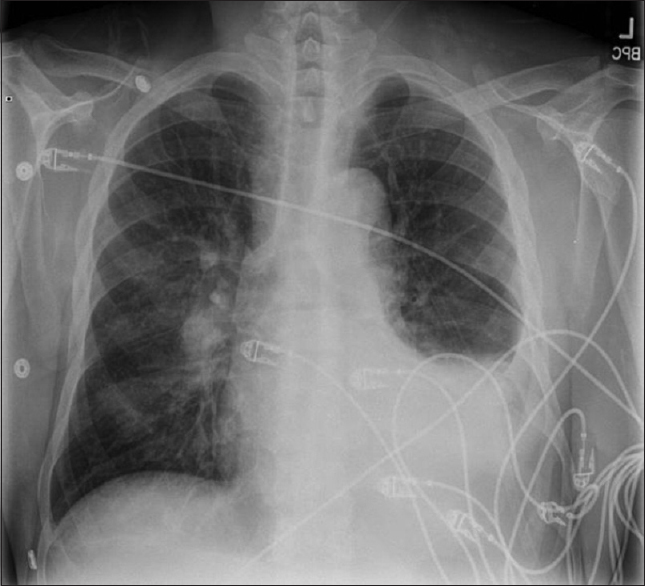 The following case illustrates this condition: An 80-year-old male patient is admitted to the intensive care unit with delirium, dehydration and malnutrition. The patient is treated with intravenous fluids for volume repletion, and acute electrolyte abnormalities are being corrected. He responds well to this initial management. On hospital day #2, he is started on nasoenteric tube feeds providing approximately 1750 kcal/day. On hospital day #3, the patient begins to experience progressive shortness of breath, muscle weakness and peripheral edema. He then develops cardiac arrhythmia and electrolyte panel shows hypophosphatemia, hypomagnesemia, and hypokalemia. A diagnosis of RFS is made, and the patient is managed with correction of electrolyte abnormalities and continued provision of adequate caloric intake. The following core competencies are addressed in this article: Medical knowledge, Patient care. Republished with permission from: Prabhakaran S. Absite corner: Refeeding syndrome. OPUS 12 Scientist 2010;4(1):3-5. 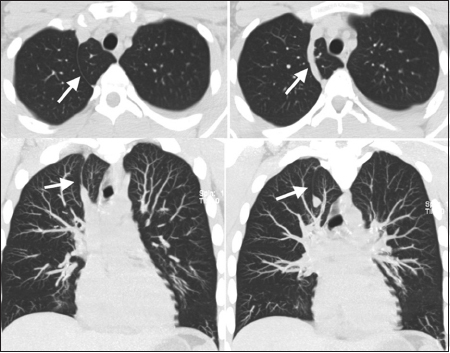 Key points: (a) Reexpansion pulmonary edema-RxPE– is a rare form of acute lung injury, with an incidence of approximately 1% following evacuation of a pneumothorax; (b) RxPE usually follows rapid reinflation of collapsed lung parenchyma; (c) The most common factor associated with RxPE is the duration of lung collapse– more than 3 days seems to be the critical amount of time; (d) The pathophysiologic changes associated with RxPE are complex and not yet fully understood; (e) The pathologic process results from a combination of rapid pulmonary reexpansion with concurrent mechanical alveolar injury, decrease in surfactant and regional lung tissue hypoxemia, inflammatory cell migration and release of inflammatory mediators, and the resulting changes in capillary-alveolar barrier occurring concurrently with increased capillary/hydrostatic pressures; (f) Clinical manifestations of RxPE vary from minimal symptoms to life-threatening hypoxia and cardio-respiratory collapse; (g) The patient may experience dyspnea, thoracic pain, cough with or without pink/foamy sputum, cyanosis, rales and stertors on auscultation. Other clinical symptoms may include fever, nausea, vomiting, tachycardia, and hypotension; (h) The symptoms of RxPE usually appear within the first two hours following pulmonary reexpansion, but may be delayed by as many as 24-48 h; (i) RxPE usually lasts clinically for as long as 1-2 days, but may take anywhere from 5 to 7 days to resolve; (j) Critical care practitioners should be familiar with the most common factors involved in the pathogenesis of RxPE; (k) The knowledge of these predisposing factors and the ability to effectively treat RxPE are important to prevention and treatment of this potentially fatal condition. The following core competencies are addressed in this article: Medical knowledge, Patient care. Republished with permission from: Stawicki SP, Sarani B, Braslow BM. 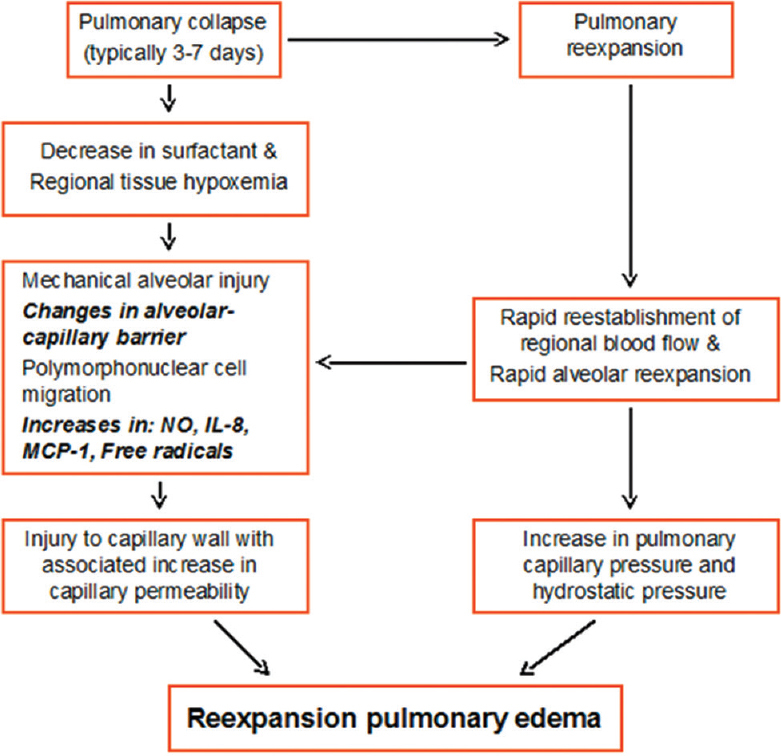 Reexpansion pulmonary edema. OPUS 12 Scientist2008;2(2):29-31. This article provides an overview of commonly utilized sedative agents, focusing on intensive care applications. High-yield information about ketamine, lorazepam, midazolam and propofol is presented. Fundamental mechanistic and drug safety details are discussed. The following core competencies are addressed in this article: Medical knowledge, Patient care. Republished with permission from: Stawicki SP. ABSITE Corner: Common sedative agents: An overview. OPUS 12 Scientist 2007;1(2):8-9. Discontinuation of mechanical ventilatory support represents a milestone in the progression to patient recovery in the Intensive Care Unit (ICU). Despite advances in mechanical ventilation and respiratory support, the science of determining if the patient is ready for extubation is still very imprecise. The goal of this article is to summarize key developments in this important clinical area. The following core competencies are addressed in this article: Medical knowledge and patient care. Republished with permission from: Stawicki SP. ICU Corner – Mechanical ventilation: Weaning and extubation. OPUS 12 Scientist 2007;1(2):13-16. Key points: (a) Polycystic kidney disease (PKD) is one of the most common genetic disorders; (b) There are two main types of PKD– autosomal dominant (most common) and autosomal recessive; (c) Diagnosis of PKD relies on a combination of clinical history, family history, imaging studies (computed tomography, ultrasound) and clinical findings (hematuria, hypertension, proteinuria); (d) Extrarenal manifestations of PKD include hepatic cysts, pancreatic and intestinal cysts, colonic diverticula, inguinal and abdominal wall hernias, valvular heart disorders, and cerebral aneurysms; (e) Treatment is centered on ameliorating symptoms and providing supportive care– therapy consists of adequate analgesia for pain symptoms, antibiotics for urinary tract infections, antihypertensive medications, renal supportive therapy; (f) Surgical indications include surgical decompression of large cysts and renal transplantation for end-stage renal failure. The following core competencies are addressed in this article: Medical knowledge and patient care. Republished with permission from: Stawicki SP, Lombardo G. Polycystic kidney disease. OPUS 12 Scientist 2008;2(1):17-20. Key points: (a) Gastrointestinal fistulae (GIF) continue to be associated with high morbidity and mortality; (b) Approximately 85% to 90% of GIF result from surgical procedures; (c) Spontaneous GIF (10% to 15%) most commonly result from inflammatory bowel disease, malignancy, and infection (i.e., diverticulitis); (d) Fistula classification and natural behavior are discussed; followed by (e) Discussion of diagnostic and treatment principles, as well as special issues encountered in GIF management. The following core competencies are addressed in this article: Medical knowledge and patient care. Republished with permission from: Stawicki SP, Braslow BM. Gastrointestinal fistulae. OPUS 12 Scientist 2008;2(1):13-16. Over 200,000 new cases of venous thromboembolism (VTE) occur annually in the United States. 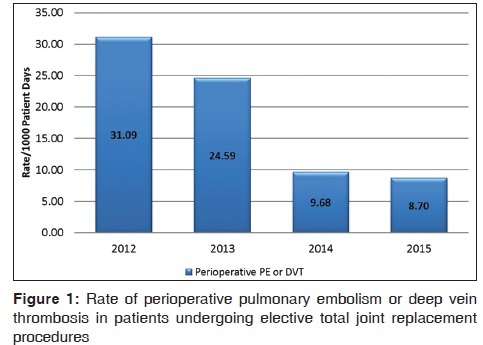 The risk of VTE is increased in hospitalized patients, and deep venous thrombosis (DVT) is a relatively common complication in patients who are acutely ill or undergo surgery. With better identification of hereditary and acquired risk factors for VTE, the modern clinician is presented with an ever-growing number of laboratory tests that can be ordered in such patients. There is considerable controversy as to how this newly available information should be utilized in clinical patient management. The goals of this article include (a) an overview of the epidemiology of venous thrombosis and its associated risk factors (including recently discovered genetic abnormalities); (b) current indications for testing for thrombophilia; (c) the appropriate choice for timing and type of testing; and (d) the interpretation of test results. Sections in the latter part of the manuscript include a description of each respective hypercoagulable condition, including diagnosis, treatment, prognostic factors, complications, and long-term care implications. The following core competencies are addressed in this article: Medical knowledge, Patient care. Republished with permission from: Prosciak MP, Stawicki SP. Hypercoagulable states: A concise review. OPUS 12 Scientist 2008;2(5):5-15. Hirschsprung's disease (HD) or congenital aganglionic megacolon is characterized by an absence of ganglion cells in the myenteric Auerbach's plexus, the deep submucosal Henle's plexus, and the submucosal Meissner's plexus in the distal colon. The usual presentation of Hirschsprung's disease can be demonstrated by the following clinical scenario. A 3-day-old male presented with failure to pass meconium within 48 h of birth and progressive abdominal distension. Barium study showed dilated colon with no specific zone of transition. The newborn was delivered at 40 weeks gestation after an otherwise normal pregnancy. Transanal rectal biopsy demonstrated the absence of ganglion cells on multiple sections and special staining. The patient underwent an exploratory laparotomy, upon which he was found to have markedly dilated small bowel and colon up to the area of sigmoid. A transverse loop colostomy was performed. The patient recovered well from the initial surgery and underwent definitive surgical therapy of the HD at a later time. The following core competencies are addressed in this article: Medical knowledge, Patient care. Republished with permission from: Prabhakaran S. Absite corner: Hirschsprung's disease. OPUS 12 Scientist 2009; 3(3):44-46. Renal failure, hepatic failure, and hepatorenal syndrome can be associated with clinically significant hypotension, a clinical state often referred to as vasoplegia or vasoplegic syndrome (VS). Vasoplegia is thought to be related to dysregulation of endothelial homeostasis and subsequent endothelial dysfunction due to direct and indirect effects of various inflammatory mediators. Vasoplegia has been observed in all age groups and in various clinical settings, including sepsis, hemorrhagic shock, hemodialysis, and cardiac surgery. Among mechanisms thought to be contributory to VS, the nitric oxide (NO)/cyclic guanosine monophosphate pathway appears to play a prominent role. Methylene blue (MB), an inhibitor of NO synthase and guanylate cyclase, has been found to improve the hypotension associated with various clinical states. Evidence also suggests that MB may be effective in improving systemic hemodynamics and vasoplegia associated with hepatic failure. We describe two cases of vasoplegia associated with concurrent hepatic and renal failure – both demonstrating a favorable hemodynamic response to MB without apparent side effects. A review of MB use in the setting of hepatic and renal failure then follows. The following core competencies are addressed in this article: Medical knowledge, Patient care. Republished with permission from: Bosoy D, Axelband J, Pursell RN, Lukaszczyk JJ, Stawicki SP. Utilization of methylene blue in the setting of hypotension associated with concurrent renal and hepatic failure: A concise review. OPUS 12 Scientist 2008;2(1):21-29. 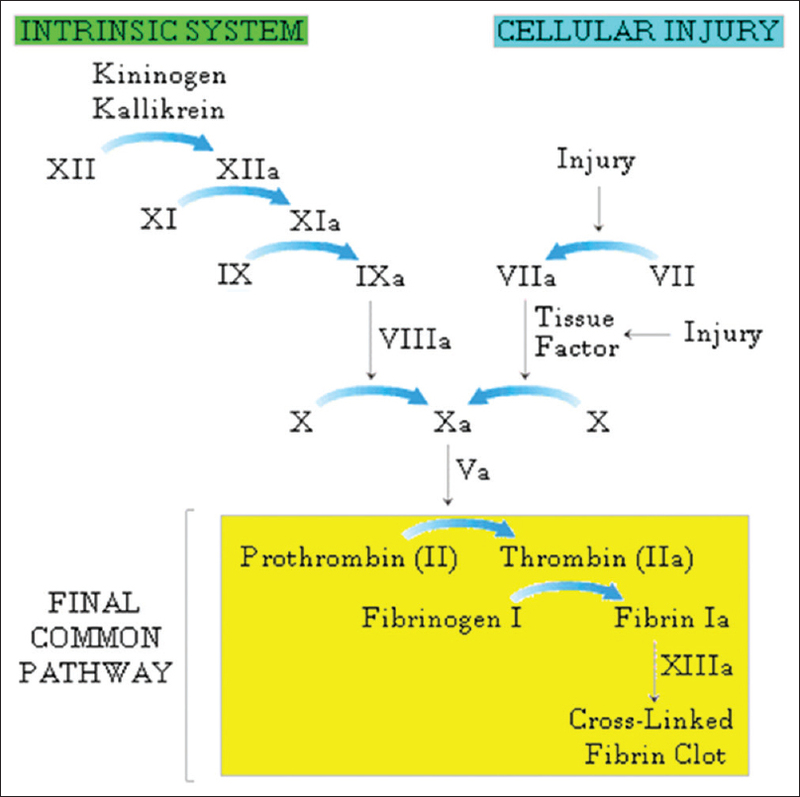 Insulin administration during cardiopulmonary bypass grafting and in the perioperative period has been shown to lower tumor necrosis factor-α, interleukin-6 (IL-6), and IL-8 levels, which are considered to be mediators of immunity and inflammation. It is not known whether perioperative hyperglycemia attenuates the action of lymphocyte attracting chemokines such as (CC-motif) ligand 20 (CCL20), also known as macrophage inflammatory protein 3; or liver activation regulated chemokine. CCL20 is a selective chemoattractant for immature dendritic cells, effector/memory T lymphocytes and naïve B cells, and is recognized as a critical regulator of both innate and acquired immunity. In this report, we describe our preliminary findings of the interaction between serum blood glucose and CCL20. Specifically, we report an increase in CCL20 temporally associated with improving glycemic control in a diabetic patient undergoing intensive insulin therapy after open heart surgery. The following core competencies are addressed in this article: Medical knowledge. Republished with permission from: Papadimos TJ, Pappada SM, Lather JD, Bazalitski V, Stawicki SP, Cameron BD, Pan ZK. Correlation between CCL20 and serum glucose in postoperative coronary bypass patient: A call for further investigation. OPUS 12 Scientist 2010; 4(1):1-2. Meningiomas constitute the second most common type of central nervous system neoplasm. Overall, these tumors represent approximately 14-30% of all central nervous system neoplasms. Brain meningiomas are usually benign. They arise from the intracranial and spinal meninges and their dural extensions. 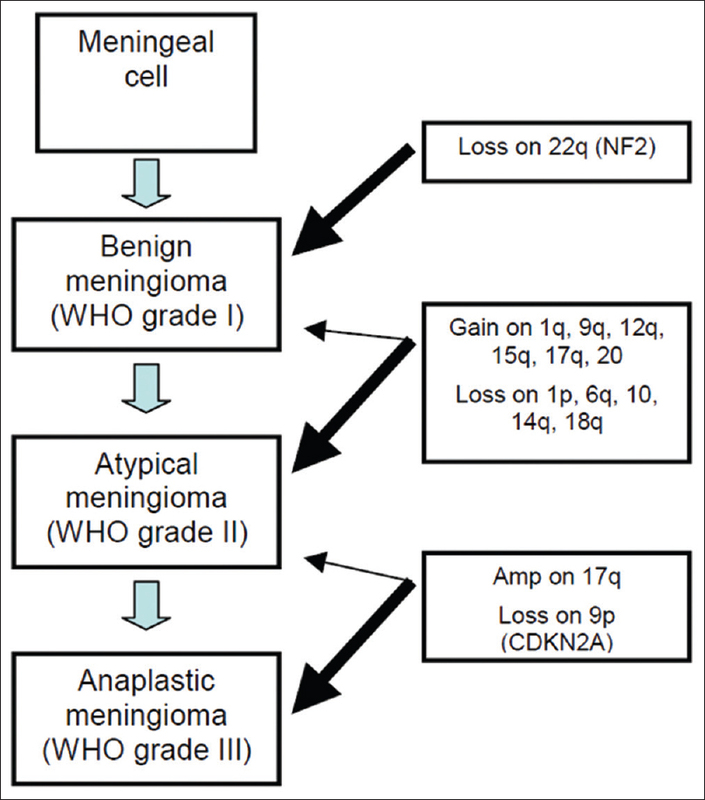 When grouped according to the WHO classification, approximately 80% of meningiomas are Grade I (benign), with the remaining 20% being either Grade II (atypical) or Grade III (malignant) lesions. The recurrence rate of meningiomas varies from 4% to 50% depending on the tumor grade, completeness of resection, and other clinical, pathologic, and radiographic factors. The authors present their experience with 333 operative cases of brain meningioma treated over a period of 25 years. This brief communication concentrates on the description of the patient subset with recurrent meningiomas. The following core competencies are addressed in this article: Medical knowledge, Patient care. Republished with permission from: Guarnaschelli JJ, Stawicki SP. Brief communication: Recurrent brain meningiomas. OPUS 12 Scientist 2008;2(2):32-34. Modern critical care medicine is based on flow of information. This information requires significant amount of interpretation to become clinically valuable. Despite the wealth of data in the modern Intensive Care Units (ICUs), intensivists often rely on fragmentary information. In an attempt to improve data trending utilization, application of financial analysis (FA) methods to vital sign data samples was examined. Two randomly chosen vital sign datasets of patients who spent at least 30 days in the ICU were retrospectively reviewed. Hourly vital sign data were retrieved and recorded for each patient. Variables tracked included systolic blood pressure for patient #1 and heart rate for patient #2. These variables were then entered into specialized FA software and subjected to computer-based processing. Trends in the recorded data were examined using (1) the stochastic oscillator (SO), (2) the moving average (MAV) convergence-divergence tool, (3) price envelope analysis and (4) MAV analysis. Both blood pressure and heart rate analyses demonstrated that vital sign data could be successfully trended using FA techniques. Not only was the vital sign data easy to read and interpret when formatted in financial-like fashion, but some trends that were not apparent on gross inspection of the numeric data were clearly demonstrated on FA. Much like with financial patterns, trends noted within vital sign data appeared to be more significant when more than one indicator identified them, utilizing the concept of a confirmatory variable. 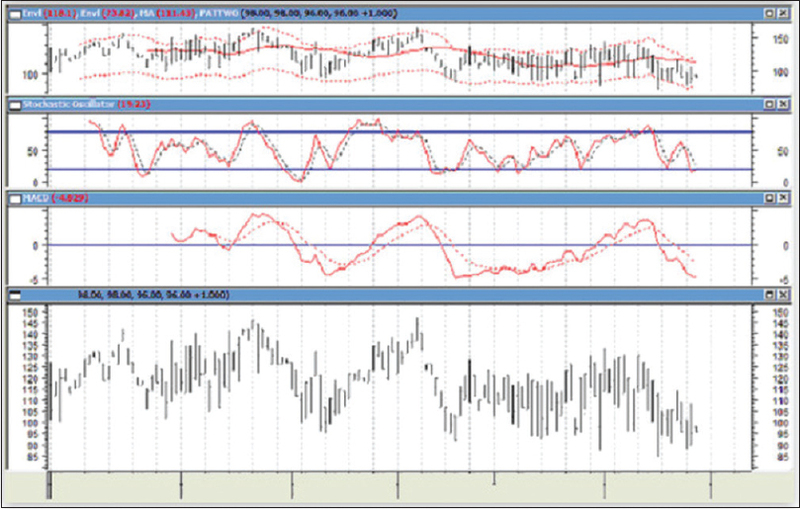 Vital sign data, much like financial data, were subject to trend reversals. 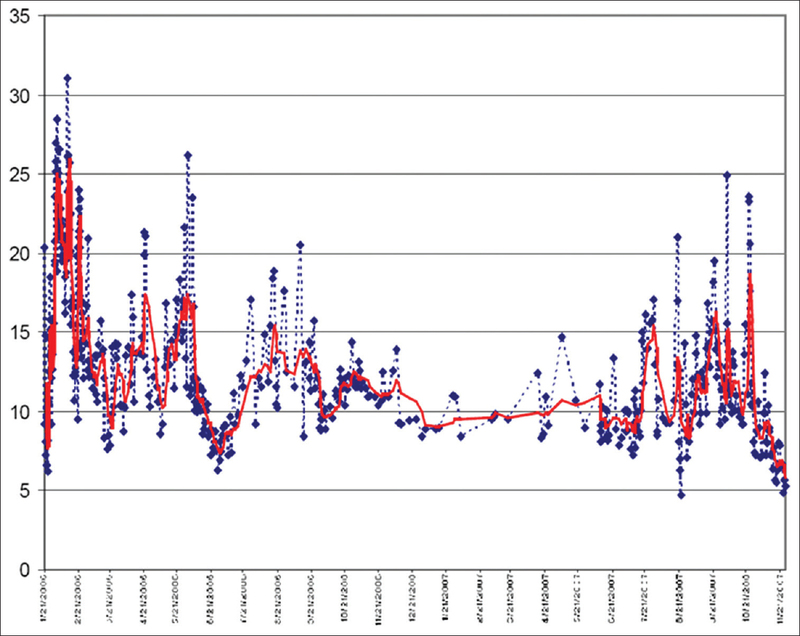 Such reversals in vital sign data appeared to follow rules similar to those followed by financial vehicles and markets. This report demonstrates that vital sign data can be subjected to the same manipulations as financial market data. Furthermore, FA tools appear to provide the interpreter of the data with means to define, confirm, and possibly predict trends and trend reversals. 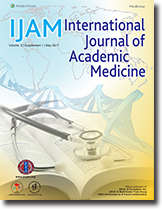 The following core competencies are addressed in this article: Medical knowledge, Practice-based learning and improvement, Systems-based practice. Republished with permission from: Stawicki SP. Application of financial analysis techniques to vital sign data – A novel method of trend interpretation in the Intensive Care Unit. OPUS 12 Scientist 2007;1(1):14-16. Modern critical care medicine depends on constant flow of massive amounts of information. This information has limited usefulness unless it is appropriately gathered, stored, displayed, and interpreted. Despite such wealth of data in the modern Intensive Care Units (ICUs), intensivists often rely on very fragmentary “snapshot” information to make important clinical decisions. In an attempt to improve the understanding of clinical data trends, application of financial analysis (FA) methods to clinical laboratory data samples were performed. Three randomly chosen, anonymized laboratory datasets of patients who spent at least 30 days in the ICU were retrospectively examined. Regularly obtained laboratory values were retrieved and recorded for each patient. Variables examined included white blood cell count, hemoglobin level, platelet count, and blood glucose levels. These variables were then entered into specialized FA software and subjected to computer-based processing. 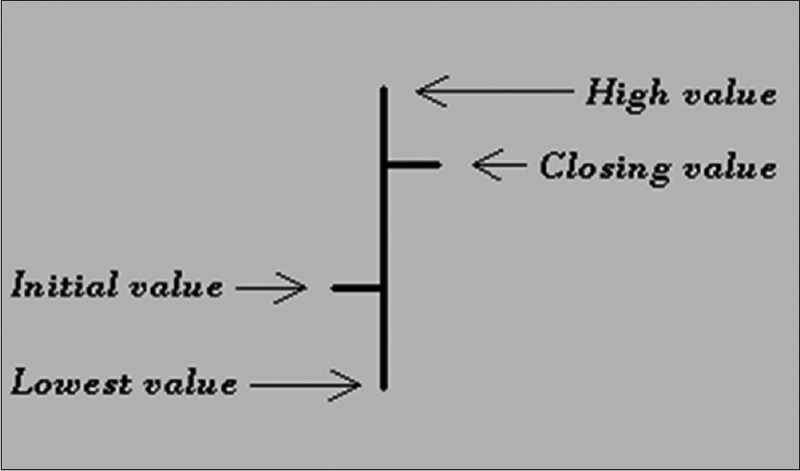 Trends in the recorded data were examined using (1) the stochastic oscillator, (2) the Relative Strength Index tool, (3) price envelope analysis, and (4) moving average analysis. All clinical laboratory parameter analyses demonstrated that laboratory data could be successfully “trended” using FA techniques. Not only were the laboratory data clearly readable and transparent when displayed in FA fashion but also some trends that were not apparent on “gross” inspection of the numeric data became very apparent after FA. Much like with financial patterns and vital sign data, trends noted within laboratory parameters appeared to be more significant when more than one indicator identified or “confirmed” them, utilizing the concept of a confirmatory variable. 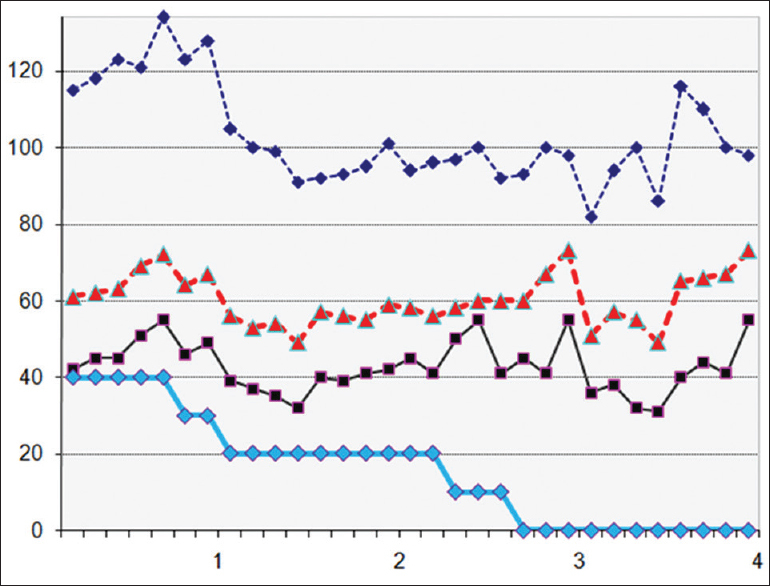 Laboratory data, much like financial and vital sign data, were subject to trend reversals. Such reversals in laboratory parameters appeared to follow patterns similar to those followed by financial vehicles and markets. This report demonstrates that laboratory data can be subjected to the same manipulations as financial market data. Furthermore, FA tools appear to provide the interpreter with means to define, confirm, and possibly predict trends and trend reversals. Assumptions for the use of FA methods in biologic parameter analysis are also presented. The following core competencies are addressed in this article: Medical knowledge, Practice-based learning and improvement, Systems-based practice. Republished with permission from: Stawicki SP. Application of financial analysis techniques to clinical laboratory data: A novel method of trend interpretation in the Intensive Care Unit. OPUS 12 Scientist. 2007;1:1-4. Improved methods of clinical data collection, storage, and processing are changing the way critical care practitioners examine and utilize the wealth of patient-related information available in the modern Intensive Care Unit (ICU). The author of this report previously outlined general methods and principles of a proposed new biomedical parameter analysis system based on well-established financial analysis (FA) methods. The new system helps to define, confirm, and potentially predict trends, and trend reversals in a number of traditional biomedical variables (vital signs, laboratory parameters, various catheter-derived pressure measurements, oximetry, temperature, and input/output variables). 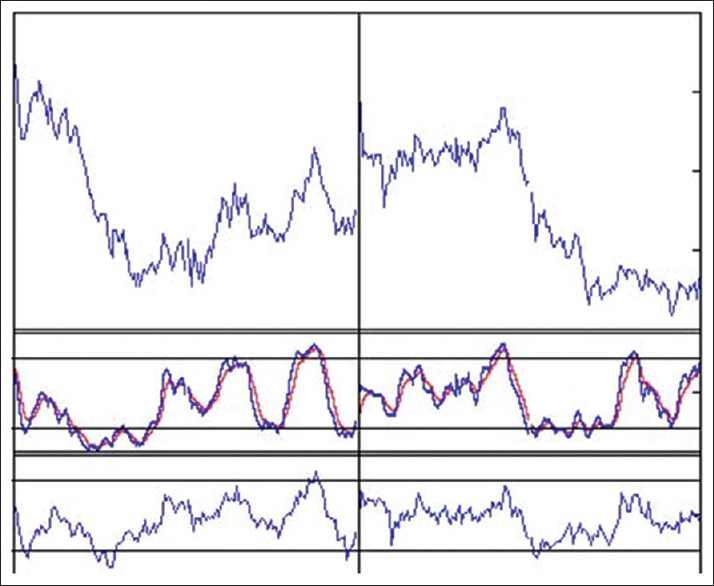 To examine the behavior of FA parameters and indicators across different temporal scales (i.e., minutes, hours, days, weeks), the author analyzed trends in various biomedical parameters using different time scales and a standardized set of FA techniques, including: (1) the stochastic oscillator, (2) the relative strength index (RSI) tool, (3) moving average, (4) moving average convergence-divergence, and (5) price envelope analysis. Randomly chosen and anonymized laboratory, urinary output, hemodynamic, and intracranial pressure datasets of patients who spent at least 21 days in the ICU were retrospectively examined. Variables were entered into specialized FA software (MetaStock, Equis International, Salt Lake City, Utah, USA) and subjected to computerized processing methods. Analyses of the above clinical parameters demonstrate that laboratory, input/output, oximetry, and transduced pressure-based data can be successfully “trended” using simple FA techniques. The data were easy to examine when displayed in FA fashion. In addition, some trends that were not easily apparent on the examination of raw numeric data or basic non-FA graphs became more apparent after the application of FA methods. These findings suggest that biomedical parameters can be subjected to the same manipulations as financial market data. In addition, FA tools appear to provide the interpreting physician with means to examine biomedical parameters across different temporal scales and resolutions (from minutes to weeks per each measurement epoch). In fact, biomedical parameters tend to display similar trends regardless of whether the data are collected on the scale of minutes, hours, days, weeks, or months. The following core competencies are addressed in this article: Medical knowledge, Patient Care, Practice based learning and improvement, Systems based practice. Republished with permission from: Stawicki SP. Financial analysis techniques in clinical practice: From 'micro' to 'macro'. OPUS 12 Scientist 2008;2(3):3-9. The importance of hyperglycemia in the Intensive Care Unit (ICU) is well established. However, little is known regarding the clinical predictive value of acute hyperglycemic events. This report describes a graphical model that quantifies the correlation between momentum/stochastic indicators, acute hyperglycemia, and clinical events in chronic ICU patients. The model is based on previously described principles of graphical representations of biomedical parameter data. We hypothesize that acute hyperglycemic events are significantly associated with major clinical events and that the model described herein helps to better characterize and quantify this important relationship. The following core competencies are addressed in this article: Medical knowledge, Patient care, Practice-based learning and improvement, Systems-based practice. Republished with permission from: Stawicki SP, Schuster D, Liu JF, Kamal J, Erdal S, Gerlach AT, Whitmill ML, Lindsey DE, Thomas YM, Murphy C, Steinberg SM. Introducing the glucogram: Description of a novel technique to quantify clinical significance of acute hyperglycemic events. OPUS 12 Scientist. 2009;3:2-5. 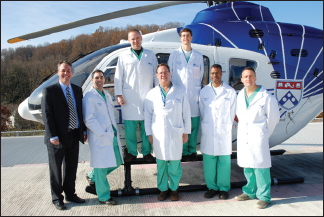 There are growing problems with the supply of trauma surgeons and/or willingness to participate in trauma care. Solutions proposed include the use of nonsurgeon providers and the development of an acute care surgery model to enhance the attractiveness of training in the field. We propose that immediate modification of clinical operations within trauma centers may address some of these problems and improve patient care and safety. The use of structured shift work models with efficient systems for communication and handoff may improve workforce utilization and vitality both in the near and far term. The following core competencies are addressed in this article: Interpersonal and communication skills, Practice-based learning and improvement, Professionalism, Systems-based practice. Republished with permission from: Grossman MD. Workforce, work hours, and workforce vitality: Toward new models of trauma coverage. OPUS 12 Scientist 2008;2(3):1-2. 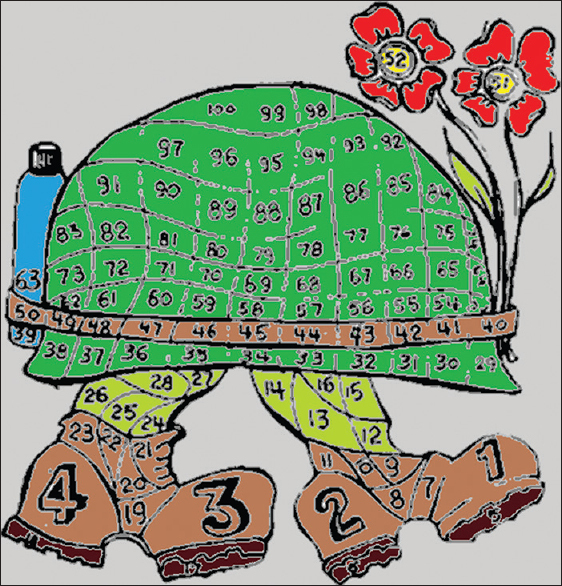 The short timer's syndrome (STS) was first described and studied in the military. Although not a new phenomenon, it was more formally recognized in the 20th century during the two World Wars. The STS has been well documented during all major military conflicts and deployments since then. In a way, STS can be viewed as an extreme form of burnout. As such, STS can be observed among medical trainees who are on busy clinical services for prolonged periods of time. In addition to its negative effects on the health-care team, burnout and STS have the potential to adversely affect patient care. It is important to be aware of signs and symptoms associated with medical trainee burnout and STS because early recognition of these signs may allow prompt intervention and prevent further progression of burnout. The following core competencies are addressed in this article: Interpersonal and communication skills, Professionalism, Systems-based practice. Republished with permission from: Stawicki SP. Short timer's syndrome among medical trainees: Beyond burnout. OPUS 12 Scientist 2008;2(1):30-32. A 45-year-old man was admitted and evaluated for epigastric pain. 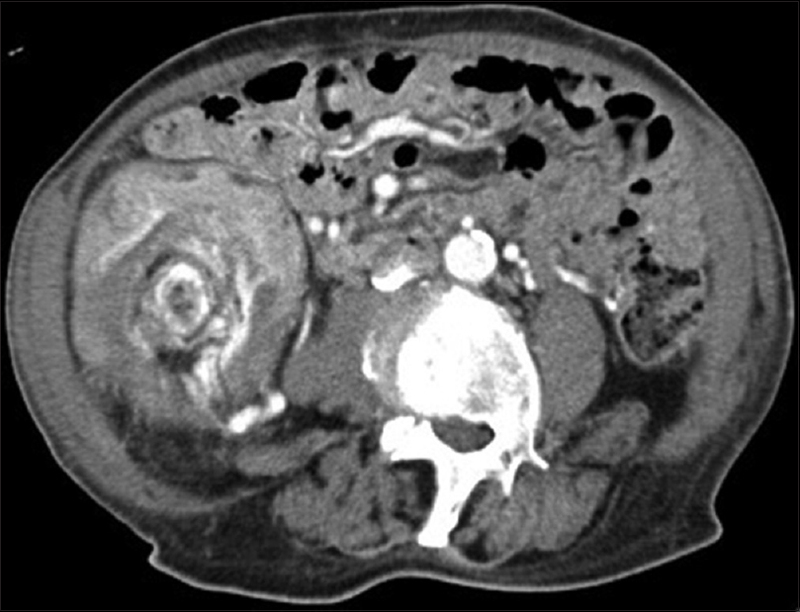 Computerized tomography scan revealed acute pancreatitis as well as incidental Situs inversus and polysplenia. The patient did not have any congenital anomalies that are usually associated with polysplenia syndrome. No anatomical anomalies were found in the duodenum, the pancreas, or biliary tree to account for pancreatitis. 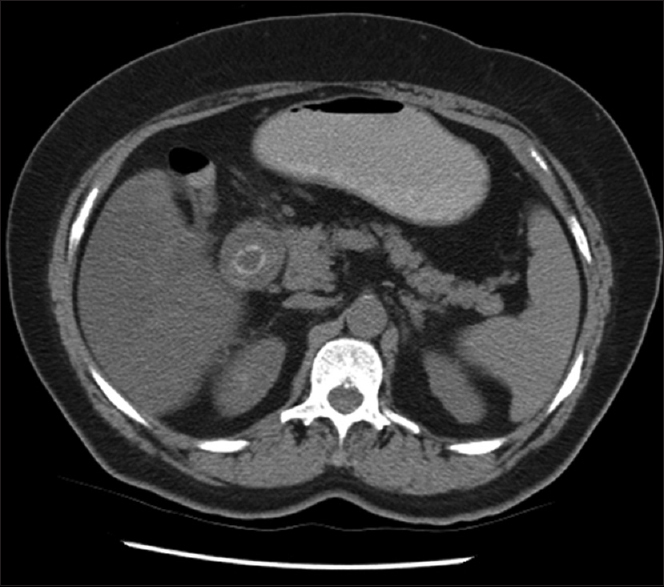 Based on history of alcohol abuse, this case was treated as alcohol-induced pancreatitis. Complete resolution of pancreatitis was seen. 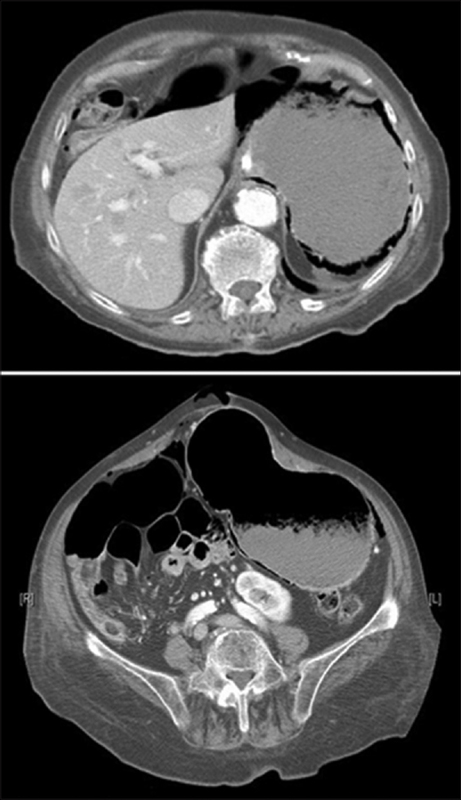 This case is unique in that it describes acute pancreatitis in the setting of heterotaxy (Situs inversus)/polysplenia syndrome. The following core competencies are addressed in this article: Medical knowledge, Patient care. Republished with permission from: Kavuturu S, Roper W, Stawicki SP. 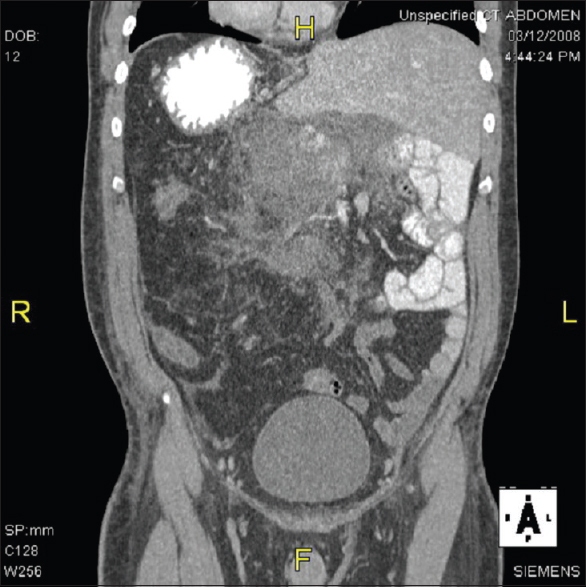 Acute pancreatitis in a patient with Situs inversus/polysplenia syndrome: A case report and review of literature. OPUS 12 Scientist 2008;2(4):10-12. The multiple comorbidities present in vascular surgery patients predispose them to surgical site infections, poor wound healing, and prosthetic graft exposure. 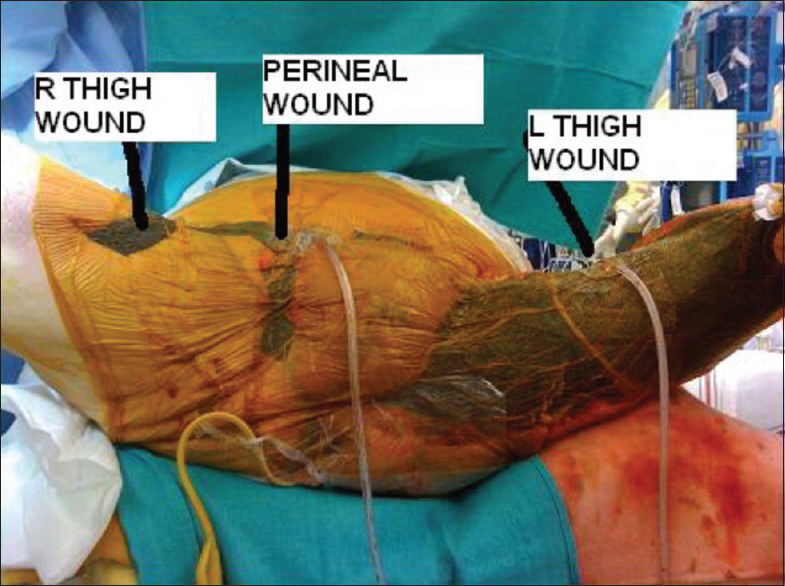 We report our experience with a patient who underwent an emergent femoral-to-femoral bypass and developed an infection at bilateral groin incisions, resulting in wound separation and prosthetic vascular graft exposure. This was successfully treated with negative pressure wound therapy (NPWT) using the vacuum-assisted closure system (V.A.C., Kinetic Concepts Inc., San Antonio, Texas, USA). This is a case in which NPWT was used to treat a groin wound with an exposed vascular prosthetic graft, thereby eliminating the need for additional surgical flap coverage procedures and ultimately resulting in a completely healed wound. The following core competencies are addressed in this article: Medical knowledge, Patient care, Practice based learning and improvement. Republished with permission from: Delaney KO, Smead W, Gordillo G. Vacuum assisted closure of an exposed prosthetic femoral graft. OPUS 12 Scientist 2008;2(4):1-3. The use of a vacuum-assisted closure (VAC) device has been associated with accelerated development of granulation tissue, earlier re-epithelialization of wounds, and faster closure of complex wounds than traditional dressings. Extensive and multiple wounds can present a challenge to traditional VAC use, especially when the wounds are separated by areas of normal tissue. A 56-year-old obese diabetic female presented with a lesion on her inner thigh. She had a 2 cm lesion on her inner thigh that was draining a grayish fluid. Extensive crepitus was palpated on both thighs and her perineum. She was diagnosed with an advanced Fournier's gangrene. An extensive debridement of all involved tissue was performed, including her labia and perineum, mons pubis, buttocks, left leg to the level of the knee, and right leg to mid-thigh level. We elected to use a VAC device for wound management. Given the complexity and extent of her wound, the traditional method of one sponge and suction tubing per wound would have required several negative-pressure devices. We devised a method using bridges of VAC foam that were effective for closing this complex series of wounds, requiring only a single negative-pressure device and two connectors. The following core competencies are addressed in this article: Medical knowledge, Patient care. Republished with permission from: Pryor III R, Sparks D, Chase D, Bogen G. Wound VAC for Fournier's gangrene: A new technique for applying a vacuum-assisted closure device on multiple wound sites using minimal connectors. OPUS 12 Scientist 2009;3(3):47-49. Traumatic aortic injury associated with diaphragmatic rupture constitutes a devastating injury complex that requires prompt recognition and treatment. The incidence of diaphragmatic rupture among patients with aortic injury has been cited to be as high as 10%. Both decision-making and technical aspects associated with this injury combination can be very challenging. We describe a case of combined aortic and diaphragmatic injuries necessitating decompressive laparotomy before definitive aortic and diaphragm repairs. Brief literature overview of the topic is also presented, focusing on the role of modern imaging techniques in diagnosing combined aortic–diaphragmatic injury. The following core competencies are addressed in this article: Medical knowledge, Patient care, Systems-based practice. Republished with permission from: Jaik NP, Hoey BA, Cipolla J, Risher WH, Stawicki SP. 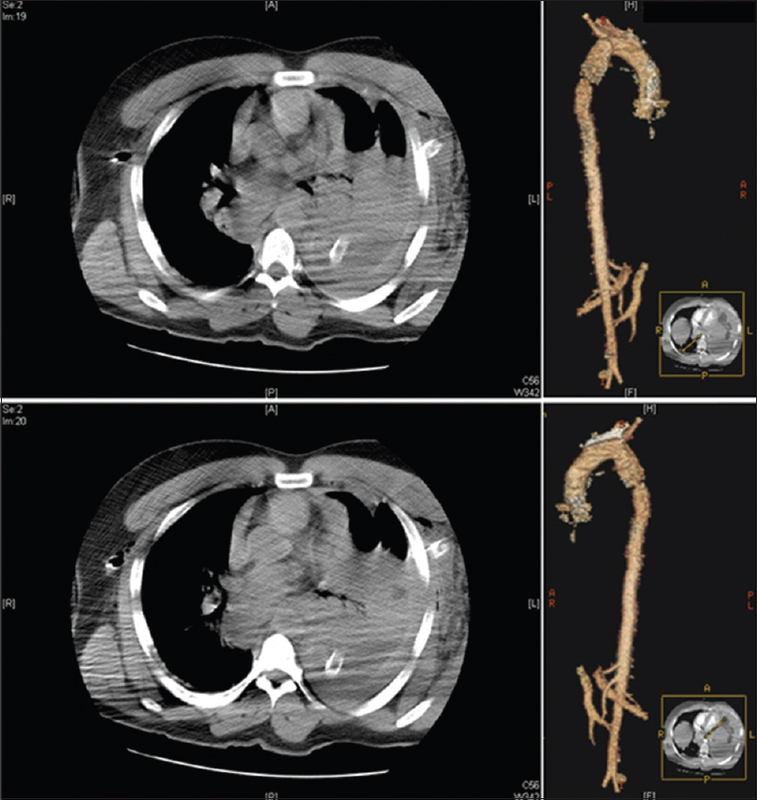 Simultaneous aortic and diaphragmatic injury following blunt trauma: A case report. OPUS 12 Scientist 2007;1(2):5-7. Gastric pneumatosis is a well-recognized clinical entity that is described in the literature as either a subtype of pneumatosis cystoides intestinalis or gastric emphysema. Gastric pneumatosis may be due to a variety of causes, which are classically categorized as infectious or noninfectious in nature. We report a case of gastric pneumatosis and pneumoperitoneum associated with a bowel obstruction secondary to an incarcerated umbilical hernia. Literature about gastric pneumatosis was reviewed and the different classifications and etiologies briefly described. Knowledge of the different types and natural history of gastric pneumatosis can be helpful when deciding on surgical versus nonoperative management of patients with this condition. The following core competencies are addressed in this article: Medical knowledge and patient care. Republished with permission from: El Chaar M, Stawicki SP, Jenoff J, Estrada FP. Incarcerated umbilical hernia associated with gastric pneumatosis: A case report OPUS 12 Scientist. 2007;1(1):9-10. Biliary-enteric fistula is a rare complication of gallstone disease, and gallstone ileus is relatively a rare cause of intestinal obstruction. Most commonly, the stone lodges in the distal ileum, colon, or duodenum. The least common site of obstruction is the proximal duodenum or pylorus causing gastric outlet obstruction (Bouveret's syndrome). Presenting signs and symptoms of Bouveret's syndrome include nausea, vomiting, epigastric pain, and abdominal distension. Obstructive jaundice, gastrointestinal hemorrhage with or without hematemesis, pancreatitis, and duodenal perforation are less common. 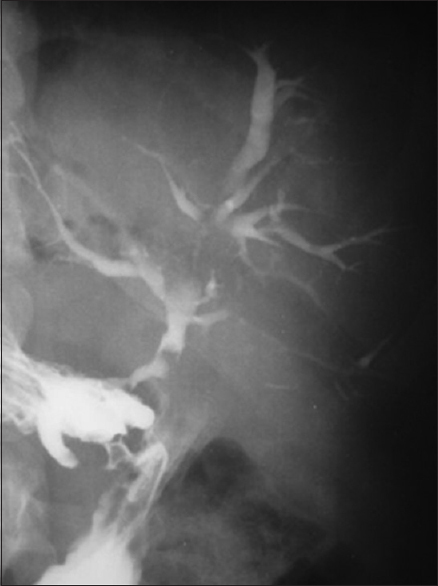 Abdominal radiography may show air in the biliary tree, mechanical bowel obstruction, and radio-opaque gallstone suggesting the diagnosis. Abdominal ultrasound or computerized tomography is diagnostic in about 60% of cases. 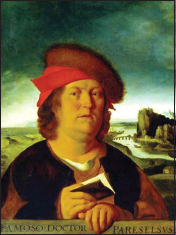 In most cases, the treatment of Bouveret's syndrome is surgical. Surgical options include (a) a single-staged enterolithotomy (or gastrostomy) with concomitant cholecystectomy and repair of the fistula or (b) an enterolithotomy alone with or without a second-stage cholecystectomy. Endoscopic extraction of the stone has been described in selected patients. Lithotripsy techniques have also been successfully used to fragment large stones. The authors present a case of Bouveret's syndrome as well as a brief literature review of this topic. The following core competencies are addressed in this article: Medical knowledge and patient care. 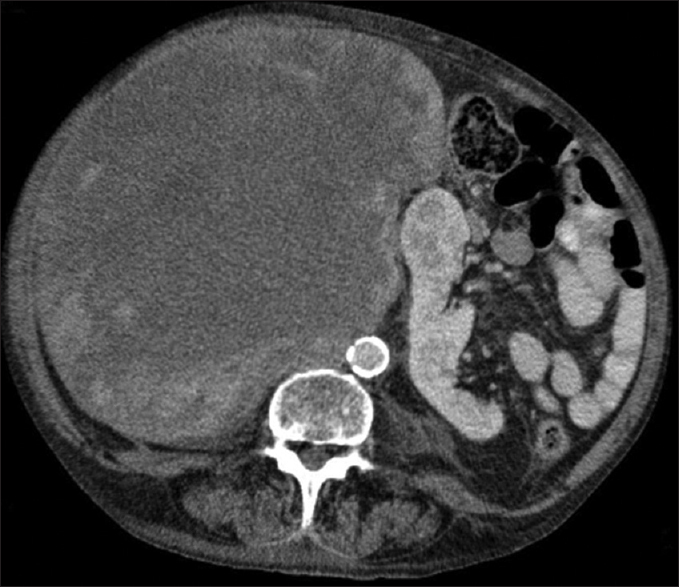 Republished with permission from: Kavuturu S, Parithivel V, Cosgrove J. Bouveret's syndrome: A rare presentation of gallstone disease. OPUS 12 Scientist 2008;2(2):11-12. The azygos lobe is a rare anomaly that developmentally arises when the right posterior cardinal vein penetrates the apex of the lung, instead of passing over it, and travels inferiorly taking pleural layers with it to entrap a portion of the right upper lobe. This article reviews the key computed tomography characteristics of azygos lobe, focusing on clinical implications. The following core competencies are addressed in this article: Medical knowledge. Republished with permission from: Wall J, Stawicki SP. Interesting clinical image: The azygos lobe. OPUS 12 Scientist 2009;3(2):28-29. This article describes a case of small bowel perforation following ingestion of homemade chicken noodle soup. The acute abdominal emergency was due to chicken bone perforating through the jejunal wall. Preoperative and intraoperative images are provided. The following core competencies are addressed in this article: Medical knowledge, Patient care. Republished with permission from: Seamon MJ. Chicken noodle soup – - Comfort food? OPUS 12 Scientist 2009;3(1):19. We describe a case of a middle-aged male with end-stage renal disease who presented with dyspnea after a recent mycoplasma infection. The following core competencies are addressed in this article: Medical knowledge, Patient care. Republished with permission from: Wallace LA, Adkins EJ, Bahner DP. Bedside sonography primer: diagnosis of pleural effusion with ultrasound. OPUS 12 Scientist 2012;6(1):12-13. 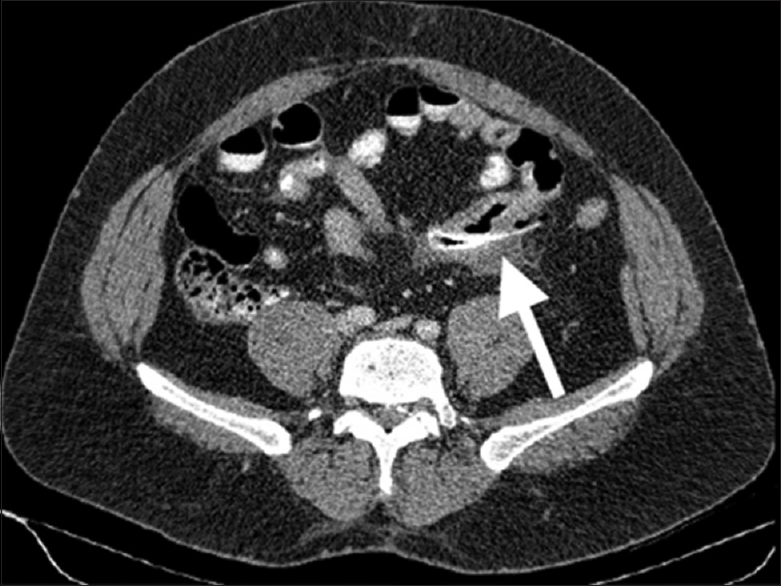 A case of traumatic fall associated with an incidental finding of a large right colonic mass is described. Computed tomography and intraoperative images are presented. The following core competencies are addressed in this article: Medical knowledge, Patient care. Republished with permission from: Hurie JB, Seamon MJ. A fortuitous fall. OPUS 12 Scientist 2008;2(5):4. 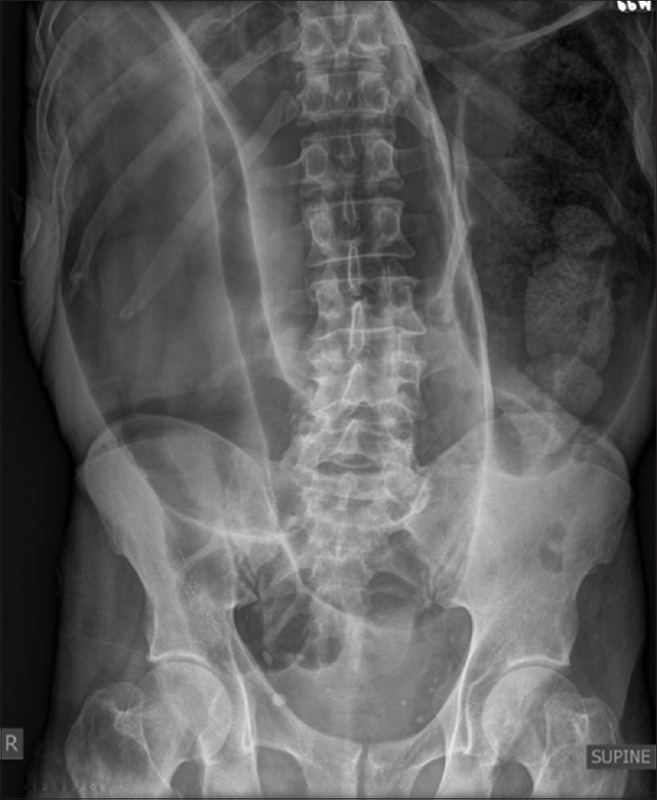 A case of a middle-aged man with simultaneous sigmoid and transverse colonic volvuli is described. Preoperative radiograph and intraoperative photographs are presented. A discussion of simultaneous volvuli involving more than one colonic segment then follows, including diagnostic and treatment considerations. The following core competencies are addressed in this article: Patient care, Medical knowledge. Republished with permission from: Wisler JR, Stawicki SPA. Interesting clinical image: Colonic “double twist”. OPUS 12 Scientist 2009;3(3):58-59. We describe a case of a middle-aged female presenting with vaginal bleeding and elevated beta-human chorionic gonadotropin. 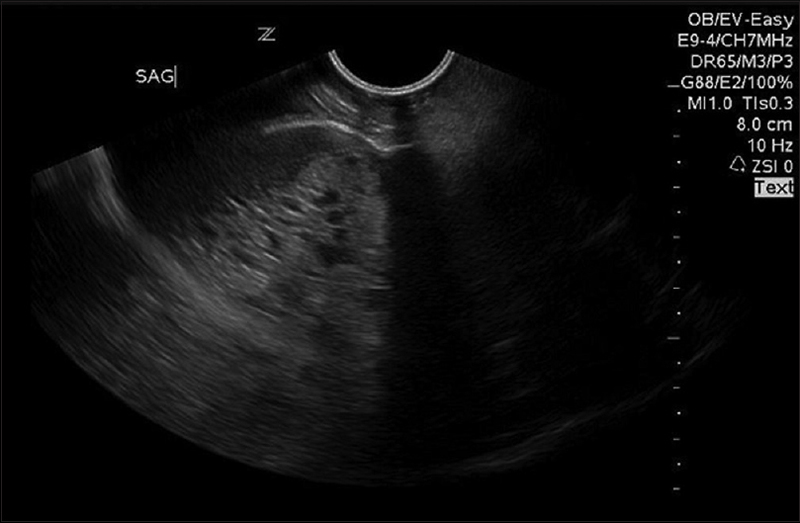 Transvaginal ultrasound images were consistent with a molar pregnancy. This example highlights the benefit of including emergency ultrasound in the clinical management of suspected gestational trophoblastic disease. The following core competencies are addressed in this article: Medical knowledge, Patient care. Republished with permission from: Schreiber S, Wallace L, Boulger CT, Bahner DP. Bedside sonography primer: Ultrasound diagnosis of a molar pregnancy. OPUS 12 Scientist 2013;7(1):1-2. Percutaneous endoscopic gastrostomy (PEG) is the preferred method for administration of long-term enteral nutrition. 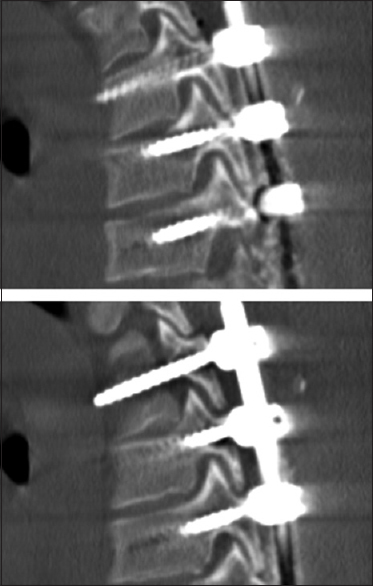 However, due largely to the high acuity of the underlying disease among patients who receive PEG tubes, this procedure can be associated with a number of serious complications. The following core competencies are addressed in this article: Medical knowledge, Patient care. Republished with permission from: Cite as: Stawicki SP. Complication of Percutaneous Gastrostomy Tubes. OPUS 12 Scientist 2008;2(4):5. 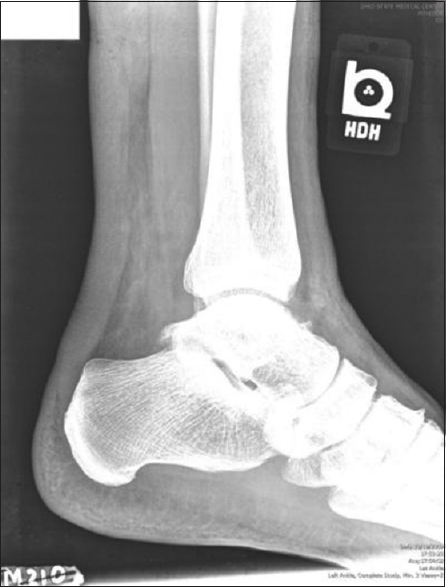 The authors describe a case of a middle-aged male with ruptured Achilles tendon sustained while jumping. Bedside ultrasound was instrumental in making the diagnosis. The following core competencies are addressed in this article: Medical knowledge, Patient care. Reprinted with permission from: Peck J, Gustafson KE, Bahner DP. Bedside sonography primer: diagnosis of Achilles tendon rupture with ultrasound in the emergency department. OPUS 12 Scientist 2011;5(2):17-18.